Def Leppard played a show on the Slang tour in Bristow, VA on 23rd July 1996 and an archive concert review is available to read. Pop Art Times reviewed the show which took place at the Nissan Pavilion. 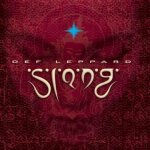 "Also interspersed was new Leppard, including "Work It Out" from "Slang" and a very interesting acoustical number "2 Steps Behind." From "Slang" and played on this tour, "Work It Out" is the first release that drummer Rick Allen has played on an acoustical drum kit since losing his arm in a car crash in 1984."